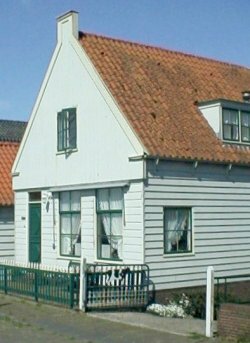 Durgerdam consists for the greater part of a long row of exquisite small houses at the edge of a narrow road on top of the old Zuiderzee dyke. 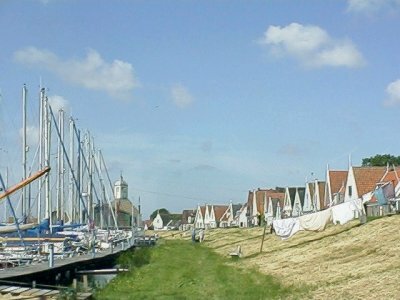 Because everything in Durgerdam occurs at a slow pace and in a homy manner, there is still present that unique feel of a centuries-old Waterland harbour village. Centuries ago Amsterdam was only a small settlement on the river Het IJ. But this hamlet became very wealthy from trading and grew very fast whilst the surrounding villages remained small in size and character. 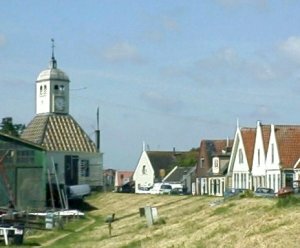 One of those still existing old villages is Durgerdam, situated to the north east of Amsterdam, in an area called the Waterland. 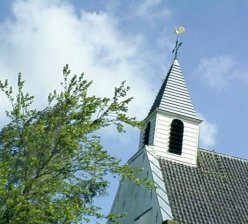 An eye-catching building in Durgerdam is the "Chapel", which was built in 1687. This small wooden building with its prominent domed tower served for only a short time as a place of worship. It has had various functions, among others that of a school and a town hall. In 1950 it was heavily damaged by a bolt of lightening and afterwards restored. Also worth seeing is the Dutch Reformed Church which was built in 1867. This small single-hall church stands on the site of an earlier 17th century church, from which the pulpit is still in the present building. For many centuries, fishing was the only source of income for the Durgerdammers, and this also during the cold winter months. In the winter, nets were spread through holes in the ice. In order to bring the fishes in movement the fishermen rapped the ice with a wooden picket, an activity which was known as "botkloppen". The inhabitants of Durgerdam long since do'nt make their living from fishing any more. 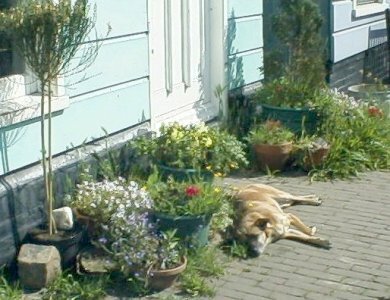 Many of the denizens now work in Amsterdam and when back in their village enjoy the beautiful vista over the Buiten-IJ. The Durgerdammers also have a magnificent view from their back gardens over the "Durgerdammer Die", a gentle polder landscape. On the horizon, there juts out the familiar stump tower of Ransdorp, once a beacon to shipping, nowadays a prominent identifying landmark for hikers. In Durgerdam, the hiker and pedestrian don't have a smooth passage, because though they are environed by a large visual expanse, the space in the village itself is rather confined. The dimensions of the place are simply not suitable to the present time.